In order to grow plants need two types of light. They need blue wavelengths of light for foliage growth and red wavelengths for flowering and fruiting. 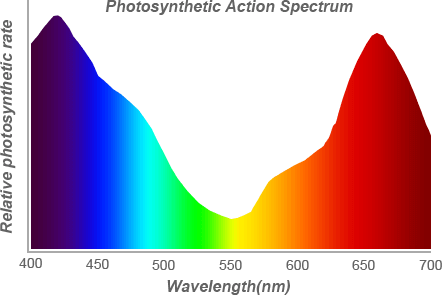 Plants don’t really need green wavelengths of light so those get reflected. That’s why plants are green. If you’re trying to grow plants indoors, you might need some supplemental lighting this time of year. Low-light plants like pothos and peace lily can do pretty well even in a windowless room as long as they have adequate artificial light. However, growing something like herbs, flowering plants, or indoor veggies inside might require additional light with a dedicated plant light. For regular, low-light houseplants you can really use any lamp or fixture with a “full spectrum” bulb. For serious indoor growing and starting seedlings, you’ll need fixtures designed for plants. You can buy grow light kits that have everything you need to get started. We stock grow lights at some of our market locations. There are mainly two types of grow lights that I would recommend today – fluorescents and LEDs. Both types of lights offer different benefits. In fact, we use both fluorescent lights (pictured above) and LEDs here at Bob’s along with larger high pressure sodium lights. High Pressure Sodium next to LEDs at Bob's. 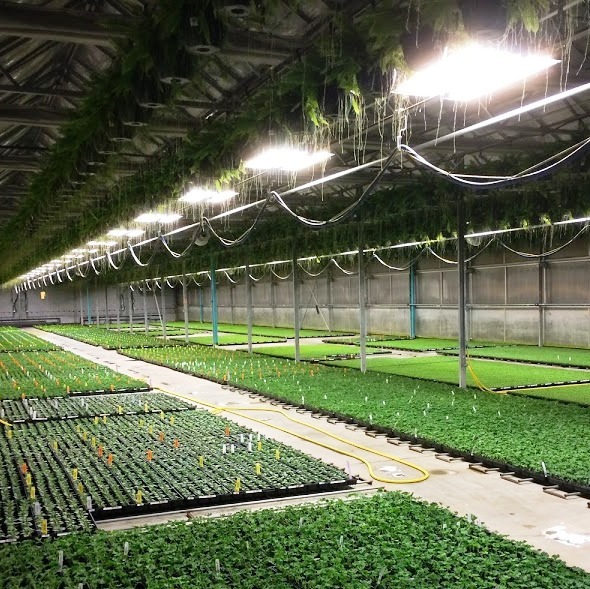 Fluorescent lights are the most economical choice for houseplants because of their low initial cost and efficiency when compared to incandescent bulbs. They come in both tubes and compact bulbs (CFL) that screw into regular sockets. Generic tubes are generally higher in blue wavelengths, so look for “full spectrum” or “daylight” bulbs. However, for a dedicated indoor growing area, look at getting bulbs labelled for growing plants. These have a more pink to purple hue so they aren’t useful for general lighting applications. LEDs (light emitting diodes) are the newest lighting technology. While they have a higher initial cost than fluorescent lights, they are more energy efficient and have a longer lifespan. Another benefit is that LEDs can be “tuned” to produce the exact wavelengths needed. This can be useful for optimizing the lighting conditions for foliage growth or flowers and fruiting. In addition to lighting choice, you’ll want to mount the lights in a way that they can be easily adjusted as the plants grow. I’ve had luck mounting larger fixtures with hook on chains, and using gooseneck-style desk lamps for screw-in bulbs. Some plant lighting kits come with timers, but if you’re building a setup yourself, a timer is a great investment. Ideally, most plants that require supplemental lighting in winter will need around 16 hours of light. However, that might vary by species and phase of the plant’s growth. Winter might be dark, dreary, and a little depressing, but it doesn’t have to be. You can create a bright and warm, plant-filled oasis in your home. You can even grow some fresh food too! Over the next few weeks we’ll take a look at crops you can grow right now indoors.